Home » Are you looking for an eye doctor in Oxford, PA? Are you looking for an eye doctor in Oxford, PA? Dr. Kelly specializes in understanding how the human eye really works, as well as diseases and conditions that affect your vision—many of which do not always have obvious symptoms. Dr. Malcolm Kelly know how age and risk factors affect vision over time for young and old, and they understand the benefits and features of corrective lenses, both as eyeglass lenses and contact lenses. Dr. Kelly at Oxford Family Eyecare takes the time to explain the results of your eye exam, describe your options and listen to your eye care needs. Because maintaining good eye health is an ongoing partnership, we encourage you to ask questions and share your health information, which could be vital to monitoring, diagnosing and treating potential vision problems. Early in his career Dr. Kelly, Jr. was the secretary of the Chester/Delaware County Optometric Society. He is a long standing member of both the Pennsylvania Optometric Association and the American Optometric Association. Dr. Kelly practices beyond "routine" eye care during his Medical Eye Health Examinations by working closely with area physicians and opthalmologists for the benefit of his patient's health needs. 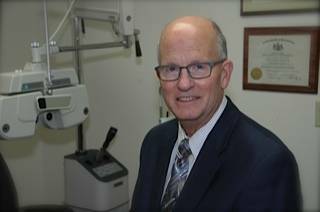 Dr. Kelly is committed to the health of his patients by keeping up on the most advanced technology and equipment in eye care. Not only does he attend many hours of continuing education a year, but requires he staff to do the same. When not in the office, Dr. Kelly’s passion is photography. Many of his photos are on display in the office. Now that his two daughters, Katie and Laura, are grown Dr. Kelly and his wife, Penny, enjoy traveling to visit them.